The Ebony Hillbillies: meshing the vanished past and the tumultuous present. Photo by Pat Casey Daley and Bill Steber. By way of the vanished past and the tumultuous present come eight gifted artists assembled in New York City by violinist/vocalist Henrique Prince. A modern-day extension of the black string bands of yore—Prince’s study of this tradition took him beyond the Mississippi Sheiks into the music’s obscure 19th century origins—the Ebony Hillbillies have entertained and educated adults and children alike from the streets of New York to the Smithsonian Museum, in visual artist collaborations at museums, at guest school programs and more. 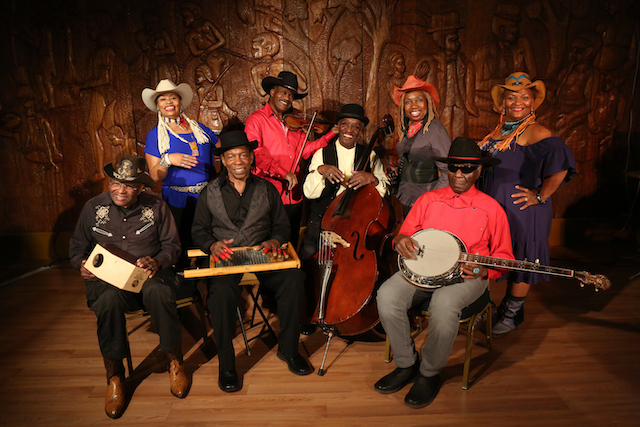 ‘Liza Jane,’ The Ebony Hillbillies perform a live version of a tune featured on 5 Miles From Town, at the IBMA World of Bluegrass 2017. Posted on YouTube by Dan Schram. 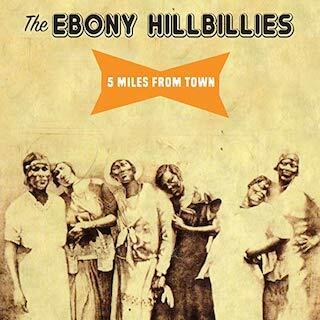 ‘I’d Rather Be,’ The Ebony Hillbillies, a live version of a song featured on 5 Miles From Town. Posted on YouTube by Music Fog. On the other hand, the mood lightens via testifying vocals and a funky, percussive arrangement of Willie Dixon’s “Wang Dang Doodle,” whereas a quiet, measured vocal and crying fiddle caress the heart’s most tender part in a rustic treatment of Bonnie Raitt’s “I Can’t Make You Love Me,” as does the stately, penultimate benediction, “Where He Leads Me (I Will Follow).” The latter was written in the mid-1800s by E.W. Blandy in a moment of personal crisis: A Salvation Army officer, Blandy found himself having to choose between an easy lifestyle working for an established church or a more challenging job in the violent neighborhood known as Hell’s Kitchen. He chose the latter. Sacrificing material comforts seems of a piece with the Ebony Hillbillies’ commitment to education as one of the principal components of their existence, their reason for being. The EH website mentions “voices raised in determination and triumph,” a most apt description of their sound. Listen, absorb and be moved by the commitment on multiple levels, musical and otherwise, this group demonstrates day in and day out, year in and year out.